One of the great joys of working on a farm is the more-than-occasional gift of extra produce from the fields. If I happen to forget my lunch during late spring/summer/early fall, I can generally count on there being a spare egg and some squash or carrots or turnips in a bin in the kitchen. Last summer, one of my favorite activities was raiding Matt’s fig tree, over on the National Colonial Farm. I had never had a fig before last summer. 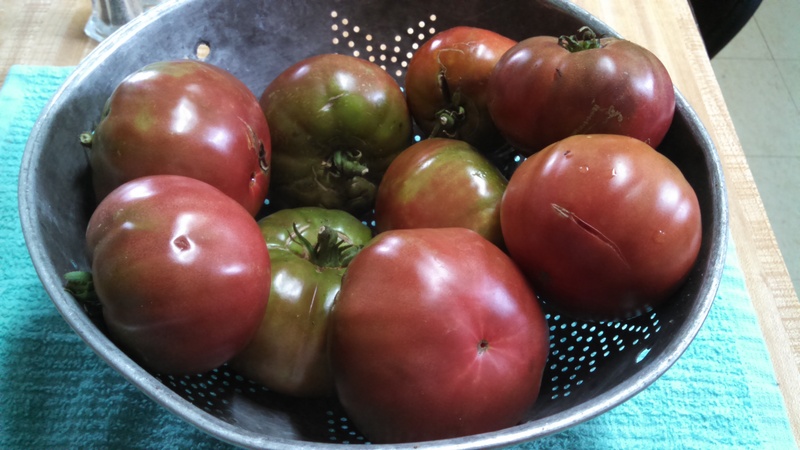 Once I tasted them, I knew I had to pick a bunch and save them for future canning. We’ve still got several bags of figs in the freezer, as we never quite got around to making the preserves, but Mom and I are planning a nice long canning session in about a month’s time. 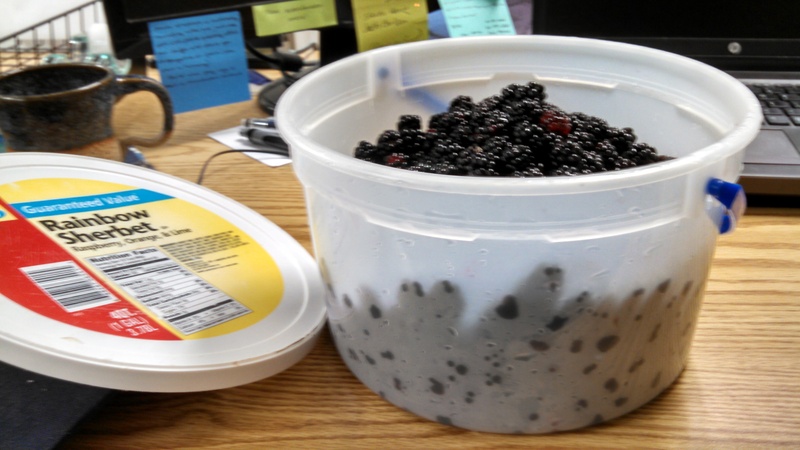 Today’s addition to the preserving list is a big bucket of blackberries. There are bushes everywhere on site, with delicate little (and sometimes not-so-little) berries, ripe for the picking. This past weekend, we had a major event on site, and I noticed a number of people stopping by the bushes along the side of the field, sampling our delicious berries. Mom joked that they were going to steal all of the fruit. No way. There’s no possible way. The entire park is just covered with blackberries. I think it’s physically impossible for people to pick them all. Of course, that doesn’t mean I can’t try. Since I knew the office was going to be pretty quiet today – most of the people have taken the day off or arranged for shorter work days, in the wake of the craziness that was Celebrating the Potomac – I brought in a giant tub and scheduled myself some time for berry picking. Casey joined me for a while, and we wandered along the Persimmon Trail (which has the fewest persimmon trees, and far more blackberries than the Blackberry Trail). My right arm has a few thorn marks, but I am largely unscathed by my journey into the brambles. And I have this to show for my labors today. That’s a one gallon container, by the way. It’s not completely full, but it’s pretty darn close. I figure Casey and I managed to pick about 3 quarts of blackberries in the span of 40 minutes. I am so tempted to go straight home and make a giant blackberry pie, but I must restrain myself. These delightful berries await a pot and some sugar, and will be jammed! I haven’t decided yet whether some of them will join the figs, or whether I’ll keep the two fruits separate. We shall see. In the meantime, I’m open to various blackberry recipes that might come my way.